Catholics of Brazilian heritage, including Suzy McBride, left, Jaqueline Shafer, Vera Lemos, Ana Carolina McGinn, Maya McGinn, 10, Olivia Carr, 7, and Rogeria Lemos, joined hands in prayer at a Grupo da Misericrdia (Divine Mercy) prayer group meeting Aug. 17. A prayer group of mostly natives of Brazil is thriving in St. Louis. Participants relish getting together to pray in Portuguese and celebrate their Catholic, South American traditions. “It’s a way for the community to be together, not only to improve our spiritual path but socially as well,” said Paulo Costa. 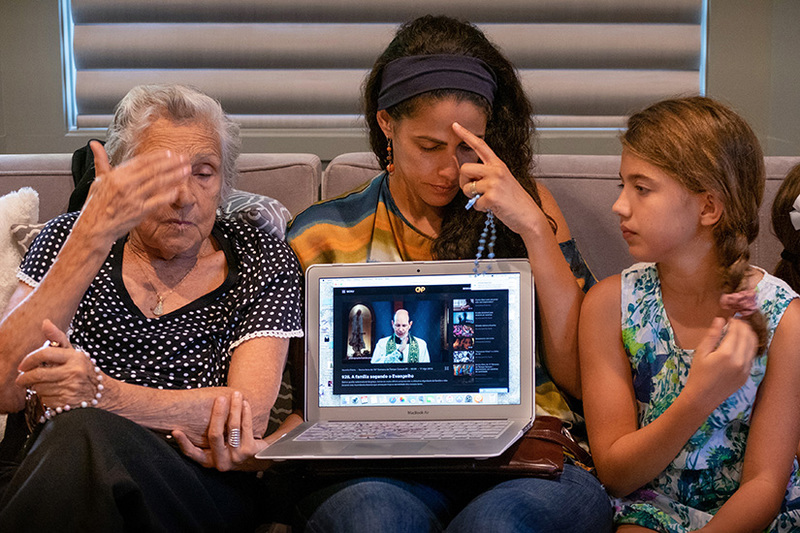 Vera Lemos, left, Ana Carolina McGinn and her daughter Maya McGinn, 10, listened to a Gospel message in Portuguese by Father Paulo Ricardo of the Archdiocese of Cuiaba in Brazil. The Grupo da Misericrdia (Divine Mercy) prayer group focuses on praying in Portuguese and maintaining South American customs, meeting a need for Catholics of Brazilian heritage in St. Louis. At a recent gathering of the group in a member’s home, about a dozen people formed a semi-circle to pray the Rosary, listen to a Gospel reading and watch and listen to a priest’s reflection on a laptop. They then held hands as they prayed and recited special intentions. Grupo da Misericórdia, the Divine Mercy prayer group, stemmed from another prayer group within the Genesis Ministry, led by Deacon Dennis Chitwood and his late wife, Elizabeth. When Elizabeth became ill and was unable to continue, prayer group members Fernanda Thurmond and Kalyne Carr trusted that God wanted them to start another group. Grupo da Misericórdia started as a group to pray the Rosary at Thurmond’s house once a week. Carr and Thurmond are Brazilian and prayed in Portuguese. Soon, other Brazilian and Latin people started to join. It was clear that there was a need from the Brazilian community to have a prayer group that prays in Portuguese. A study by Jack Strauss of St. Louis University in 2012 showed a growing number of workers from Brazil employed by St. Louis firms such as Monsanto due to export opportunities. Two years after the start of the Divine Mercy prayer group, Thurmond moved back to Brazil. Carr welcomed the prayer group at her house. The most important purpose of the group is to pray, said Maria Dona Jô. She appreciates the family setting with meetings in homes. It’s fun also to celebrate birthdays and anniversaries as a family would, she added. “So many beautiful things have developed” as a result of the gatherings, she said. Vera Lemos, left, and Ana Carolina McGinn rehearsed music for a Mass in Portuguese to celebrate the Feast of Our Lady of Aparecida Oct. 12. Our Lady of Aparecida is the principal patroness of Brazil. Lemos represented one of four generations of a family at the event. 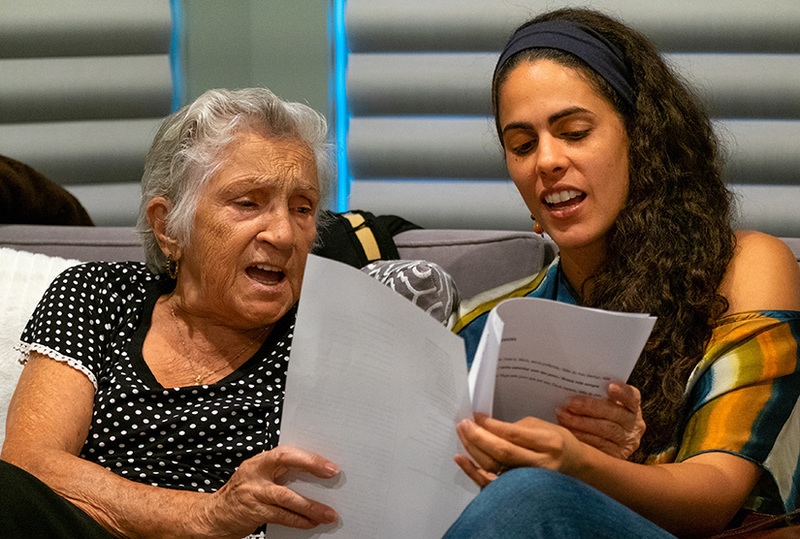 Her mother, Vera Lemos, age 84, is spending the summer and fall as a visitor with her daughter, granddaughter and great granddaughter. Vera Lemos also is impressed with the sense of community of the group and how they share things about their lives. “They live their faith openly,” she said. She’ll return to Brazil happy that her family has a community and such strong faith, she said. McGinn said the prayer group is “very healthy for our family.” The social impact is important as is service to the St. Louis community through donations, she said. The group reaches out, for example, to people served by the food pantry at St. Anthony of Padua Parish. Recently the pantry received more than 40 boxes of clothing, shoes, personal care items and money from the group. In addition, Grupo da Misericórdia gives personal assistance to families from Brazil seeking treatment at local children’s hospitals. McBride said the group has challenges such as finding a priest who speaks Portuguese. Giovanni Madriz, program director of the archdiocese’s Office of Hispanic Ministry, assisted the prayer group members in organizing what is now an annual feast day Mass in October for Our Lady of Aparecida, the patron saint of Brazil. A statue of Our Lady of Aparecida is in a prominent place in the home where the group meets. Thurmond donated the statue to the Office of Hispanic Ministry, and it rotates among the households of the Brazilian community. “I feel her presence every time we get together,” Costa said. A Mass on the feast of Our Lady of Aparecida, the principal patroness of Brazil, will be celebrated at 6 p.m. Friday, Oct. 12, at St. Joseph Church, 567 St. Joseph’s Lane in Manchester. The Mass is open to people from all cultures and is touted especially as a good cultural exchange opportunity for children. Members of Grupo da Misericórdia prepare music and help plan for the Mass. In October of 1717, three fishermen prayed to Our Lady of Immaculate Conception asking God to grant them fish to catch. Soon after dragging a headless statue of the Virgin Mary and then the head, the fishermen reported catching plenty of fish. They named the statue Nossa Senhora Aparecida (Our Lady of the Appeared Conception) and a special devotion began followed by many miracles. The image attracted large crowds to the village where the fishermen lived, and over the next years much time was devoted in building chapels and eventually the biggest Marian shrine in the world, located in Aparecida, Sao Paulo. On July 16, 1930, Pope Pius XI declared Our Lady Aparecida as the main patroness of Brazil. Her feast day is celebrated on Oct. 12 and since 1980 it has been a national holiday.